Jean-Paul Marat (May 24, 1743 – July 13, 1793), was a Swiss-born French scientist and physician who made much of his career in the United Kingdom, but is best known as an activist in the French Revolution. A fiery journalist, an advocate of such violent measures as the September 1792 massacres of jailed "enemies of the Revolution," and a member of the radical Jacobin faction (though never a member of the Jacobin Club as such) during the French Revolution, he helped launch the Reign of Terror and compiled "death lists." He was stabbed to death in his bathtub by self-proclaimed Girondist Charlotte Corday. He was portrayed in the 1963 play Marat/Sade. The fall of the Girondins on 2 June, helped by the actions of François Hanriot, the new leader of the National Guard, was one of Marat's last great achievements. Forced to retire from the Convention as a result of his worsening skin disease, he continued to work from home, where he soaked in a medicinal bath. Now that the Montagnards no longer needed his support in the struggle against the Girondins, Robespierre and other leading Montagnards began to separate themselves from him, while the Convention largely ignored his letters. 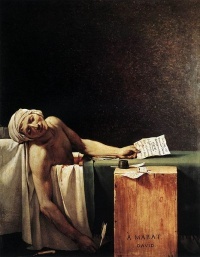 Marat was in his bathtub on 13 July, when a young woman from Caen, Charlotte Corday, appeared at his flat, claiming to have vital information on the activities of the escaped Girondins who had fled to Normandy. Despite his wife Simonne's protests, Marat asked for her to enter and gave her an audience by his bath, over which a board had been laid to serve as a writing desk. Their interview lasted around fifteen minutes. He asked her what was happening in Caen and she explained, reciting a list of the offending deputies. After he had finished writing out the list, Corday claimed that he told her, "Their heads will fall within a fortnight". A statement which she later changed at her trial to, "Soon I shall have them all guillotined in Paris". This was unlikely since Marat did not have the power to have anyone guillotined. At that moment, Corday rose from her chair, drawing out from her corset the five-inch kitchen knife, which she had bought earlier that day, and brought it down hard into Marat’s chest, where it pierced just under his right clavicle, opening the carotid artery, close to the heart. The massive bleeding was fatal within seconds. Slumping backwards, Marat cried out his last words to Simonne, "Aidez-moi, ma chère amie!" ("Help me, my dear friend!") and died. Corday was a Girondin sympathiser who came from an impoverished royalist family – her brothers were émigrés who had left to join the exiled royal princes. From her own account, and those of witnesses, it is clear that she had been inspired by Girondin speeches to a hatred of the Montagnards and their excesses, symbolised most powerfully in the character of Marat. The Book of Days claims the motive was to "avenge the death of her friend Barboroux". Marat's assassination contributed to the mounting suspicion which fed the Terror during which thousands of the Jacobins' adversaries – both royalists and Girondins – were executed on supposed charges of treason. Charlotte Corday was guillotined on 17 July 1793 for the murder. During her four-day trial, she had testified that she had carried out the assassination alone, saying "I killed one man to save 100,000." Marat's assassination led to his apotheosis. The painter Jacques-Louis David, a member of one of the two "Great Committees" (the Committee of General Security), was asked to organize a grand funeral. David took up the task of immortalizing Marat in the painting The Death of Marat, beautifying the skin that was discoloured and scabbed from his chronic skin disease in an attempt to create antique virtue. David, as a result of this work, has since been criticized as glorifying the Jacobin's death. The entire National Convention attended Marat's funeral and he was buried under a weeping willow, in the garden of the former Club des Cordeliers (former Couvent des Cordeliers). After Marat’s death, he was viewed by many as a martyr for the revolution, and was immortalized in various ways in order to preserve the values he stood for. His heart was removed and hung from the ceiling of the Cordeliers Club in order to inspire speeches that were similar in style to Marat’s eloquent journalistic skills. On his tomb, the inscription on a plaque read: "Unité, Indivisibilité de la République, Liberté, Égalité, Fraternité ou la mort". His heart was embalmed separately and placed in an urn in an altar erected to his memory at the Cordeliers. His remains were transferred to the Panthéon on 25 November 1793 and his near messianic role in the Revolution was confirmed with the elegy: Like Jesus, Marat loved ardently the people, and only them. Like Jesus, Marat hated kings, nobles, priests, rogues and, like Jesus, he never stopped fighting against these plagues of the people. The eulogy was given by the Marquis de Sade, delegate of the Section Piques and an ally of Marat's faction in the National Convention (there is evidence to suggest that shortly before his death Marat had fallen out with de Sade and was arranging for him to be arrested). By this stage de Sade was becoming appalled with the excesses of the Reign of Terror and was later removed from office and imprisoned for "moderatism" on the fifth of December. His memory lived on in the Soviet Union. Marat became a common name and the Russian battleship Petropavlovsk (Template:Lang-ru) was renamed Marat in 1921. A street in the centre of Sevastopol was named after Marat (Template:Lang-ru) on 3 January 1921, shortly after the Soviets took over the city. After Marat's death, his wife may have sold his bathtub to her journalist neighbour, as it was included in an inventory of his possessions after his death. The royalist de Saint-Hilaire bought the tub, taking it to Sarzeau, Morbihan in Brittany. His daughter, Capriole de Saint-Hilaire inherited it when he died in 1805 and she passed it on to the Sarzeau curé when she died in 1862.A journalist for Le Figaro tracked down the tub in 1885. The curé then discovered that selling the tub could earn money for the parish, yet the Musée Carnavalet turned it down due to its lack of provenance as well as the high price. The curé approached Madame Tussaud's waxworks, who agreed to purchase Marat's bathtub for 100,000 francs, but the curé's acceptance was lost in the mail. After rejecting other offers, including one from Phineas Barnum, the curé sold the tub for 5,000 francs to the Musée Grévin, where it remains today. The tub was in the shape of an old-fashioned high-buttoned shoe and had a copper lining. Unless indicated otherwise, the text in this article is either based on Wikipedia article "Jean-Paul Marat" or another language Wikipedia page thereof used under the terms of the GNU Free Documentation License; or on original research by Jahsonic and friends. See Art and Popular Culture's copyright notice. This page was last modified 07:14, 7 June 2013.